Sleeping Egg Zone is the third zone of Sonic Chaos for the Sega Game Gear / Sega Master System, coming after Gigalopolis and preceeding Mecha Green Hill Zone. In keeping with the other stages of this game, Sleeping Egg consists of two standard Acts followed by a shorter, third Act which contains the boss. Geographically, this Zone is located on South Island (as is the rest of Sonic Chaos). Sleeping Egg Zone is an unusual stage with many breakable blocks, and numerous foreground walls emblazoned with Robotnik's image (as in Crystal Egg Zone for Sonic the Hedgehog 2 (8-bit)). 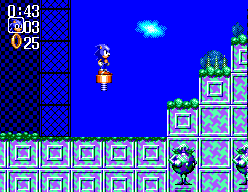 There are industrial-strength pogo springs scattered throughout the level, which our heroes can use for bouncing up to otherwise inaccessible areas; it has been speculated that this item's behavior was to be used in some prototypes of Sonic 2. The greatest danger in Sleeping Egg Zone comes not from the weird onion-bot badniks or other hazards, but rather falling off the screen in one of the many yawning, bottomless voids that litter the stage. It seems the best way to classify Sleeping Egg is as some sort of high-altitude construction site of Eggman's; as some of the level appears incomplete, with metal frameworks and half-finished block-like walls. This page was last edited on 28 September 2018, at 07:40.